Wins and losses are all that matter. Margin of victory isn’t important. Emeryville Public Market. Lunch. Football. The San Francisco 49ers. It started when I expressed a nagging concern about losing to the Raiders in Week 14. Because you know, $*!% happens. Why are you worried about the Raiders? They’ve lost 16 games in a row! I know. That is a lot of games to lose. The Raiders are bad at football. I expect the 49ers to beat them; and given the respective current states of each team, I would expect these 49ers to beat these Raiders…90% of the time, or something. But half of the Raiders losses have been by 7 points or fewer; that means they are 0-5 in games decided by a touchdown (/one possession) or less. They lost 14-19 on the road to the Jets, 9-16 on the road to the Patriots, 28-31 at home to the Chargers, 24-30 on the road to Seattle, and 6-13 on the road to the Chargers this past weekend. In last year’s primer, I highlighted five teams that had particularly good records in close games in 2011: the Raiders (7-2 in close games in 2011), Packers (5-1), Saints (4-1), 49ers (6-2), and Steelers (5-2). In 2012, despite the presence of several star quarterbacks on their respective rosters, those same five teams went a combined 16-16-1 in games decided by one touchdown or less. Think about this conceptually. All else equal, would you rather play a team that had lost 10 games by 20 points each, or a team that had lost 10 games by 1 point each? Presumably the second team, with the much narrower margin of defeat, is a tougher opponent. Next, would you rather play a team that had lost 9 games by 20 points each and won 1 game by 1 point, or a team that had lost 10 games by 1 point each? The second team has the worse record; the first team has the worst point differential. All else equal, despite their worse record, the second team is still presumably a tougher opponent than the first team. This is because wins and losses are an imperfect measure of pure performance. Think about how these imaginary teams “performed”. The first team was dominated 9 times out of 10. The second team has been rather competitive with every opponent, only losing by one point. Context matters! Wins and losses are all that matters. Margin of victory isn’t important. Obviously, in a sense that is true. The teams with the most wins make the playoffs. But purely in terms of predicting how well a team will play (say, against the 49ers in Week 14), margin of victory matters a great deal. In fact, margin of victory is a better predictor of a team’s future chances than victory itself. How can that be? Reducing a game purely to a win, a loss, or a tie for each team is not very useful. Not all wins are created equal.2 If Team A beats Team C by 1 point, and Team B beats Team C by 20 points, while Teams A and B are equal in wins, B certainly seems stronger than A. Turns out, there is a way to quantify such measures, aggregating across many games and years. I have gathered the wins, losses, ties, points for, and points against for all teams for each year from 2002-2013.3 The 2008 Detroit Lions went a historic 0-16. Yet their point differential (268 for, 517 against) maps to 2.8 Pythagorean wins. They may not have counted in the score book, but perhaps it is some comfort to Lions fans that their winless season was only the 8th worst in the sample, by Pythagorean standards. The 2007 New England Patriots, meanwhile, went an equally historic 16-0. Their point differential (589 for, 274 against) is in fact the very best of any team since 2002. Yet in 2007 they totaled 13.8 Pythagorean wins. To be sure, that is a lot4, but short of the 16 actual wins they achieved. Oversimplifying5, a win in a given season amounts to .28 more wins in the next season; there is a positive correlation of 28%.6 And similarly, a loss in a given season amounts to .28 more losses in the next season. However, a Pythagorean win in a given season amounts to .38 more (actual) wins in the next season; there is a positive correlation of 38%. All else equal, Pythagorean wins say more about a team’s future than actual wins. Margins–of victory, and defeat–matter. On April 28th, 2011, the Jacksonville Jaguars traded two draft picks–the 16th and 49th overall–to the Washington D.C. Football Team and moved up six spots in the first round to select quarterback Blaine Gabbert tenth overall. Using Kevin Meers’ (president of the Harvard Sports Analysis Collective) draft pick approximate value, did this look like a good trade at the time? No. 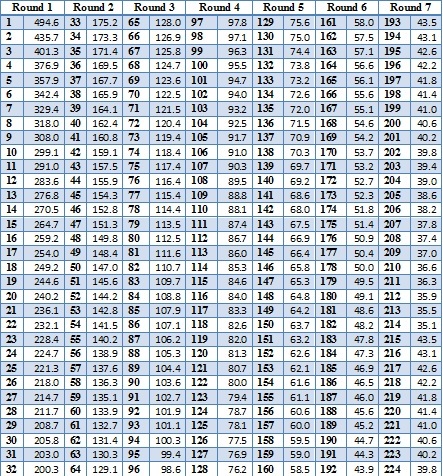 Meers’ chart, pictured below, uses the career approximate value statistic from Pro Football Reference going back through the last 20-plus drafts to estimate relative pick worth, and answer the question: what is a fair deal when trading draft picks for draft picks? Using Meer’s valuation, you can see this never looked like a good deal for the Jaguars. On average the tenth overall pick is 39.9 (units1) more than the 16th pick, or 15 percent better. In giving up their second round, 49th overall pick worth 148.4, the Jaguars seemingly overpaid substantially. The difference between how much moving up was worth and what Jacksonville actually gave up–110 units–is worth the 82nd overall pick, in the middle of the third round. The trade would have been reasonable for a top-three pick; but, even just seven spots later down at tenth, the numbers indicate it was a bad idea. The numbers do not tell everything. Meers’ valuation does not reveal that Gabbert was rushed into starting prematurely after presumed starting quarterback David Gerrard bizarrely left football, or that he played behind a below-average offensive line in each of his three seasons, including the third-worst league-wide his second year (per Pro Football Focus). These factors cannot be forgot. But after three years of awful play from Gabbert, yesterday the Jaguars traded him to the San Francisco 49ers, for the current fourth-to-last pick of the sixth round, worth about 45 points in Meers’ system.2 Ironic how that is the sort of pick the Jaguars should have traded to move up in the first place.